The CDI series of metal gate CMOS arrays is a low-cost family of seven gate arrays that range in complexity from 60 to 880 equivalent gates and from 22 to 72 pins. The HC series of silicon gate CMOS arrays is a high-performance family of seven devices that range from 300 to 1782 equivalent gates and from 40 to 92 pins. The HCS series is compatible with the HC series but offers higher performance and density. Seven HCS series devices are available, ranging from 300 to 1782 gates in complexity and from 40 to 92 pins. If it's VLSI you want, we offer the fastest single layer metal high-density CMOS gate array available - a 4 micron silicon gate digital array - our HCS Series. Our HCS Series has the best performance record of any single layer semi-custom product available and it leads the competition in VLSI technology. That info is from a publication called IC Master 1984, Volume 2, and is from pages 4461 and 4463. There is copy on archive.org. You'll notice that there is a discrepancy with the name of the 1260 gate device. I suspect that the second image is the correct number, i.e. HCS12600, because that makes sense and is consistent with the others. The HCS10017 might be the realisation of an HCS10000 with Oric's logic gate design applied to it? Perhaps that is how they managed the part numbering, e.g. by having some kind of incremental numbering. Just a guess. Something that would appear to support that though is the numbering of the Telestrat HCS chips, which are HCS3119 and HCS3120. By this theory, those two would be HCS3100 devices with the custom logic applied. If the HCS10017 is an HCS10000, then it has up to 1000 2-input gates. From my earlier post, we know that it is CMOS, that it has a single metal layer, and uses silicon (probably polysilicon) for the gates, and that they're 4 micron silicon gates. Really interesting. I notice at the bottom of the advert that there is an address in Newbury, Berkshire, UK, for a company called Guiltspur Micro Systems that is a supplier within the UK. Oric also had an address in Berkshire, UK, in Ascot. It's probably a 45 minute drive between the two. I wonder if they did their business through the UK company, or whether they worked directly with CDI in San Jose, California. Nice and very interesting bit of research! Thanks for putting in the effort to dig that up! Already this is starting to look very similar to the earlier image that I extracted from the California Devices advert. In my next post (because I can't seem to attach more than 3 images to this one), I'm going to show just how close these images are to each other. There are a few things missing in each case, but they are certainly the same structure. In the case of the left hand image, the boundaries of the p-type and n-type "Active"/Diffusion areas are not shown. In the case of the right hand image, there are some metal lines that are not shown. The reason for the difference in metal lines is because the right hand image is of uncommitted cells, whereas the left hand image has custom logic programmed into it (i.e. by adding the necessary metal lines to form the logic gates required). So a reminder again, the left most image comes from the California Devices advert, the middle image from the first black and white image of the CDI gate array structure from the lecture slides, and the right most image comes from the "CDI Unprogrammed Array" image. Given that the image from the California Devices advert is described as the "HCS Series", then there is no doubt in my mind that the images from the lecture slides are a good representation of what we would expect to see on the surface of an HCS Series CMOS chip, such as the HCS10000. Not a lot mentioned about CDI, but there are a number of images relating to CDI gate arrays. Look at the last two pages of the PDF, also in Chapter 13. This image contains four cells. Two of them are 2 input cells, and the other two are 3 input cells. So what this means is that the cells probably toggle like that across the chip, i.e. 2 input cell, 3 input cell, 2 input cell, 3 input cell, etc. The images from the lecture slides appear to imply this. From reading a bit on how CMOS gate array sizes are measured, they are usually given in what is known as "equivalent gates". For example, the HCS10000 has 1000 equivalent gates. An equivalent gate is defined as two pairs of transistors with which a two input NAND or NOR logic gate can be made. What this means is that 1000 equivalent gates is 4000 transistors. To get an idea of whether that is enough for the HCS10017, the 6502 CPU apparently has something like 4528 transistors (if you include the depletion mode pull up transistors, which really you should for the comparison to be fair). So the HCS10017 seems like it should have enough equivalent gates to achieve the functionality we're expecting. One last note about the above image. It has 10 transistors. A transistor is formed where the polysilicon (red lines in the earlier images) pass over the Active/Diffusion areas. 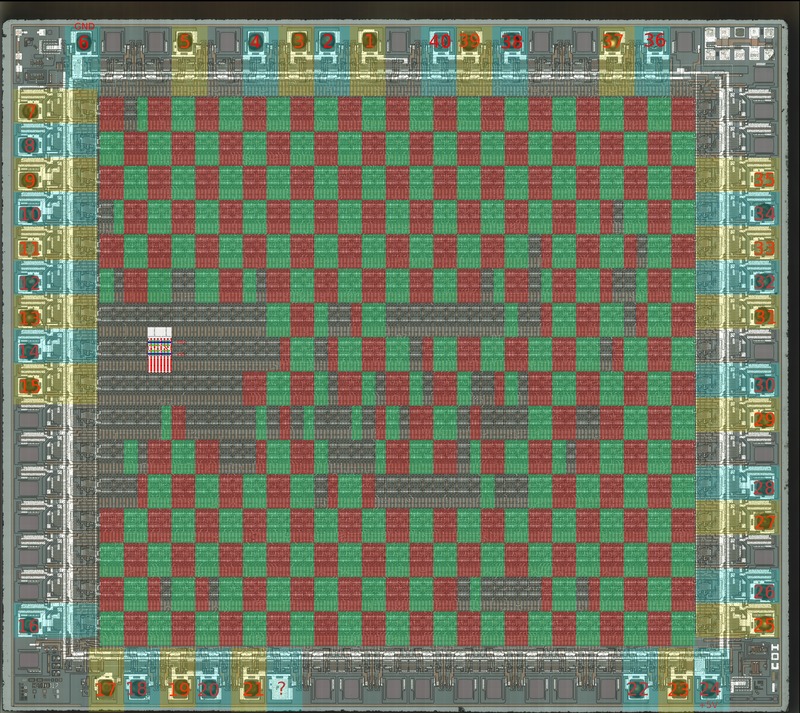 If we're expecting 4000 transistors, and there are 10 in each of these "tiles", then it might give us an idea of how many times this tile is repeated in each direction. Presumably the shape after repeating in each direction is roughly square. I'll have to play around a bit to see what some likely numbers are, and then use GIMP to generate an image of that size with this small section tiled the necessary number of times in each direction to achieve a roughly square image with 1000 equivalent gates (4000 transistors). The end result might be getting close to what we're expecting the uncommitted CMOS gate array part of the surface of the HCS10000 to look like. Then its only the custom metal lines that make up the "Paul Johnson designed" HCS10017 specific logic that we'll need to wait for the silicon surface photographs (i.e. die shots) to reveal the placement of. I'm really hoping to arrange for such photos to be made over the coming weeks. Then its only the custom metal lines that make up the "Paul Johnson designed" HCS10017 specific logic that we'll need to wait for the silicon surface photographs (i.e. die shots) to reveal the placement of. I'm really hoping to arrange for such photos to be made over the coming weeks. A decap of the ULA would be awesome, specially if we can reverse the logic accurately. The nice thing about it being a CMOS gate array is that the diffusion areas and polysilicon lines are in pre-defined areas, as are the VDD and VSS lines. I'm used to looking at fully custom NMOS die shots, and for those you need to identify everything. But for this CMOS gate array, all we'll need to do is identify where the smaller (i.e. smaller than the VDD and VSS) metals lines are. Still a big task but seems more straight forward than reversing the 6502 or 6522 or AY-3-8912. So hopefully what we'll end up with will be accurate. And its all digital as well, which makes it easier. Huhu, reading the first paragraphs I was going to suggest coloring, only to be rewarded on the next paragraph with exactly that. Given the evidence in the colored version it is clear that the differences are simply the mask used to program the gate array, the bottom layers are almost identical to the manufacturer's unprogrammed ones. To be precise, the CDI gate array section of Chapter 13 is at Page 73 and even though it is short it is complete enough to understand the process. And holy kitty, this PDF is impressively exhaustive. I pity the poor souls who have to follow this class in under one year. Do you know Deus Ex Silicium? Last week (or it was probably the end of the week before), I started making a few enquiries about this. I spoke to Mike Connors (who is the same man who decapped the ZX Spectrum ULA for Chris Smith as part of his excellent investigation into that chip). My email was asking simply for a quote as to how much it might cost to get the chip decapped and photographed. Mike said he'd need to take a look at the chip to get an idea. So I couriered him a few chips that I'd already bought for this purpose. Mike confirmed that he'd received the chips Tuesday last week. This is a commercial lab, so I was preparing myself for a quote that I probably wouldn't be able to justify paying by myself. I wanted to get an idea though. I hadn't heard anything since Tuesday last week, so I sent Mike an email late last night. About mid-morning today, I received a reply from Mike to say that his engineer had already taken some photos. This was more progress than I had been expecting. I was still expecting a quote of some sort. I tried not to get my hopes up and assumed that it was perhaps just a test to give me an idea of what they could produce. Then as I was on my way home from work this evening, I received another email from Mike with a link to a file asking if I could access that link. I tried and I could. At this point I had my mind on getting home as quickly as I could to see what was in the file. I didn't fancy trying to download it on my phone. It was rather big. To cut a long story a bit short, the file I downloaded was a package containing various files, including the full HCS10017 die shot in perfectly clear quality. I certainly wasn't expecting this. So I wrote back to Mike Conners asking how much I owed him for this. He replied saying that he isn't able to charge for the work (perhaps commercial labs can't charge for this type of reverse engineering), and he asked as payment only that I mention his name and the company, i.e. he did it as a promotional favour. So I would like to say a very big thank you to Mike at Datel for doing this work for us, at no cost. It really is far more than I was expecting, and the quality is amazing. And if any business is considering having some professional reverse engineering done, then check out Mike's Raw Science webpage mentioned above. @Dbug, the above link will probably die at some point. So I was wondering if you have space on your Oric file server to give it a more permanent location? I will probably also make various dieshot websites aware of this so that they can store copies. We need to preserve this for all time now. So I guess it means we can advertise this die shot on facebook, twitter, etc... copy it, modify it, etc... all we need is to say that Datel allowed that to happen? - Dieshot_thumbnail_zoomed_details.png, the same, but with some zoomed in details to show easily how it looks on the large quality one. Last edited by Chema on Tue Jul 24, 2018 10:17 pm, edited 1 time in total. Below are download links for two additional images that Mike Connors sent me with the original die shot image. Unfortunately it is a bit too low res, so difficult to make things out. This one is much clearer and gives an example of what the hi res annotated image would look like. I have asked Mike Connors if he could send me the larger copy of the annotated image, since it seems like they must have created one. Hoping to hear back soon.